The movements of single actin filaments along a myosin-fixed glass surface were observed under a conventional fluorescence microscope. Although random at a low concentration, moving directions of filaments were aligned by the presence of over 1.0 mg/mL of unlabeled filaments. We found that actin filaments when at the intermediate concentrations ranging from 0.1 to 1.0 mg/mL, formed winding belt-like patterns and moved in a two-directional manner along the belts. These patterns were spread over a millimeter range and found to have bulged on the glass in a three-dimensional manner. Filaments did not get closer than about 37.5 nm to each other within each belt-pattern. The average width and the curvature radius of the pattern did not apparently change even when the range of actin concentrations was between 0.05 and 1.0 mg/mL or the sliding velocity between 1.2 and 3.2 μm/sec. However, when the length of filaments was shortened by ultrasonic treatments or the addition of gelsolin molecules, the curvature radius became small from 100 to 60 μm. These results indicate that this belt-forming nature of actin filaments may be due to some inter-filament interactions. To investigate the dehydration associated with protein folding, the partial molar volume changes for protein unfolding (ΔVu) in cytochrome c (Cyt c) were determined using high pressure absorption spectroscopy. ΔVu values for the unfolding to urea- and guanidine hydrochloride (GdnHCl)-denatured Cyt c were estimated to be 56±5 and 29±1 mL mol–1, respectively. Considering that the volume change for hydration of hydrophobic groups is positive and that Cyt c has a covalently bonded heme, a positive ΔVu reflects the primary contribution of the hydration of heme. Because of the marked tendency of guanidium ions to interact with hydrophobic groups, a smaller number of water molecules were hydrated with hydrophobic groups in GdnHCl-denatured Cyt c than in urea-denatured Cyt c, resulting in the smaller positive ΔVu. On the other hand, urea is a relatively weak denaturant and urea-denatured Cyt c is not completely hydrated, which retains the partially folded structures. To unfold such partial structures, we introduced a mutation near the heme binding site, His26, to Gln, resulting in a negatively shifted ΔVu (4±2 mL mol–1) in urea-denatured Cyt c. The formation of the more solvated and less structured state in the urea-denatured mutant enhanced hydration to the hydrophilic groups in the unfolding process. Therefore, we confirmed the hydration of amino acid residues in the protein unfolding of Cyt c by estimating ΔVu, which allows us to discuss the hydrated structures in the denatured states of proteins. The majority of hypertrophic cardiomyopathy (HCM) is caused by mutations in sarcomere proteins. We examined tropomyosin (Tpm)’s HCM mutants in humans, V95A and D175N, with in vitro motility assay using optical tweezers to evaluate the effects of the Tpm mutations on the actomyosin interaction at the single molecular level. Thin filaments were reconstituted using these Tpm mutants, and their sliding velocity and force were measured at varying Ca2+ concentrations. Our results indicate that the sliding velocity at pCa ≥8.0 was significantly increased in mutants, which is expected to cause a diastolic problem. The velocity that can be activated by Ca2+ decreased significantly in mutants causing a systolic problem. With sliding force, Ca2+ activatable force decreased in V95A and increased in D175N, which may cause a systolic problem. Our results further demonstrate that the duty ratio determined at the steady state of force generation in saturating [Ca2+] decreased in V95A and increased in D175N. The Ca2+ sensitivity and cooperativity were not significantly affected by the mutations. These results suggest that the two mutants modulate molecular processes of the actomyosin interaction differently, but to result in the same pathology known as HCM. Circular dichroism spectroscopy is widely used for analyzing the structures of chiral molecules, including biomolecules. Vacuum-ultraviolet circular dichroism (VUVCD) spectroscopy using synchrotron radiation can extend the short-wavelength limit into the vacuum-ultraviolet region (down to ~160 nm) to provide detailed and new information about the structures of biomolecules in combination with theoretical analysis and bioinformatics. The VUVCD spectra of saccharides can detect the high-energy transitions of chromophores such as hydroxy and acetal groups, disclosing the contributions of inter- or intramolecular hydrogen bonds to the equilibrium configuration of monosaccharides in aqueous solution. The roles of hydration in the fluctuation of the dihedral angles of carboxyl and amino groups of amino acids can be clarified by comparing the observed VUVCD spectra with those calculated theoretically. The VUVCD spectra of proteins markedly improves the accuracy of predicting the contents and number of segments of the secondary structures, and their amino acid sequences when combined with bioinformatics, for not only native but also nonnative and membrane-bound proteins. The VUVCD spectra of nucleic acids confirm the contributions of the base composition and sequence to the conformation in comparative analyses of synthetic polynucleotides composed of selected bases. This review surveys these recent applications of synchrotron-radiation VUVCD spectroscopy in structural biology, covering saccharides, amino acids, proteins, and nucleic acids. PolyADP-ribosylation (PARylation) is a posttranslational modification that is involved in the various cellular functions including DNA repair, genomic stability, and transcriptional regulation. PARylation is catalyzed by the poly(ADP-ribose) polymerase (PARP) family proteins, which mainly recognize damaged DNA and initiate repair processes. PARP inhibitors are expected to be novel anticancer drugs for breast and ovarian cancers having mutation in BRCA tumor suppressor genes. However the structure of intact (full-length) PARP is not yet known. We have produced and purified the full-length human PARP1 (h-PARP1), which is the major family member of PARPs, and analyzed it with single particle electron microscopy. The electron microscopic images and the reconstructed 3D density map revealed a dimeric configuration of the h-PARP1, in which two ring-shaped subunits are associated with two-fold symmetry. Although the PARP1 is hypothesized to form a dimer on damaged DNA, the quaternary structure of this protein is still controversial. The present result would provide the first structural evidence of the dimeric structure of PARP1. Transport of small molecules across the cell membrane is a crucial biological mechanism for the maintenance of the cell activity. ABC transporter family is a huge group in the transporter membrane proteins and actively transports the substrates using the energy derived from ATP hydrolysis. In humans, there are 48 distinct genes for ABC transporters. A variation of a single amino acid in the amino acid sequence of ABC transporter has been known to be linked with certain disease. The mechanism of the onset of the disease by the variation is, however, still unclear. Recent progress in the method to measure the structures of huge membrane proteins has enabled determination of the 3D structures of ABC transporters and the accumulation of coordinate data of ABC transporter has enabled us to obtain clues for the onset of the disease caused by a single variation of amino acid residue. We compared the structures of ABC transporter in apo and ATP-binding forms and found a possible conformation shift around pivot-like residues in the transmembrane domains. When this conformation change in ABC transporter and the location of pathogenic variation were compared, we found a reasonable match between the two, explaining the onset of the disease by the variation. They likely cause impairment of the pivot-like movement, weakening of ATP binding and weakening of membrane surface interactions. 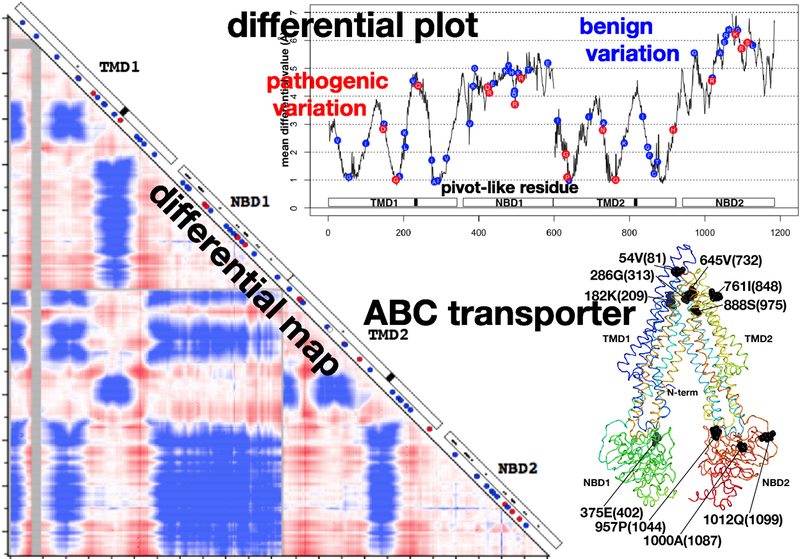 These findings will give a new interpretation of the variations on ABC transporter genes and pave a way to analyse the effect of variation on protein structure and function. Growth factor receptor-bound protein 2 (Grb2) is an adaptor protein that plays a critical role in cellular signal transduction. It contains a central Src homology 2 (SH2) domain flanked by two Src homology 3 (SH3) domains. Binding of Grb2 SH2 to the cytoplasmic region of CD28, phosphorylated Tyr (pY) containing the peptide motif pY-X-N-X, is required for costimulatory signaling in T cells. In this study, we purified the dimer and monomer forms of Grb2 SH2, respectively, and analyzed their structural and functional properties. Size exclusion chromatography analysis showed that both dimer and monomer exist as stable states. Thermal stability analysis using circular dichroism showed that the dimer mostly dissociates into the monomer around 50°C. CD28 binding experiments showed that the affinity of the dimer to the phosphopeptide was about three fold higher than that of the monomer, possibly due to the avidity effect. The present crystal structure analysis of Grb2 SH2 showed two forms; one is monomer at 1.15 Å resolution, which is currently the highest resolution analysis, and another is dimer at 2.00 Å resolution. In the dimer structure, the C-terminal region, comprising residues 123–152, was extended towards the adjacent molecule, in which Trp121 was the hinge residue. The stable dimer purified using size exclusion chromatography would be due to the C-terminal helix “swapping”. In cases where a mutation caused Trp121 to be replaced by Ser in Grb2 SH2, this protein still formed dimers, but lost the ability to bind CD28. Organs and tissues in multi-cellular organisms exhibit various morphologies. Tubular organs have multi-scale morphological features which are closely related to their functions. Here we discuss morphogenesis and the mechanical functions of the vertebrate oviduct in the female reproductive tract, also known as the fallopian tube. The oviduct functions to convey eggs from the ovary to the uterus. In the luminal side of the oviduct, the epithelium forms multiple folds (or ridges) well-aligned along the longitudinal direction of the tube. In the epithelial cells, cilia are formed orienting toward the downstream of the oviduct. The cilia and the folds are supposed to be involved in egg transportation. Planar cell polarity (PCP) is developed in the epithelium, and the disruption of the Celsr1 gene, a PCP related-gene, causes randomization of both cilia and fold orientations, discontinuity of the tube, inefficient egg transportation, and infertility. 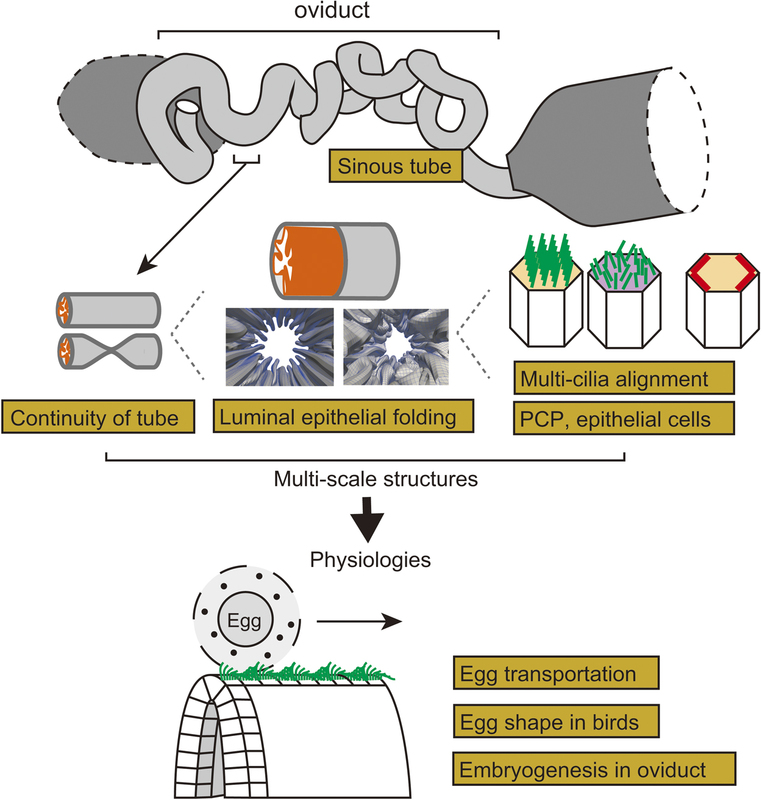 In this review article, we briefly introduce various biophysical and biomechanical issues in the oviduct, including physical mechanisms of formation of PCP and organized cilia orientation, epithelial cell shape regulation, fold pattern formation generated by mechanical buckling, tubulogenesis, and egg transportation regulated by fluid flow. We also mention about possible roles of the oviducts in egg shape formation and embryogenesis, sinuous patterns of tubes, and fold and tube patterns observed in other tubular organs such as the gut, airways, etc. Membrane vesicles (MVs) are lumen-containing spheres of lipid bilayers secreted by all prokaryotes into the extracellular milieu. They have multifunctional roles in stress response, virulence transfer, biofilm formation, and microbial interactions. Remarkably, MVs contain various components, including lytic enzymes, genetic materials, and hydrophobic signals, at high concentrations and transfer them effectively to the target microbial cells. Therefore, MVs act as carriers for bactericidal effects, horizontal gene transfer, and quorum sensing. 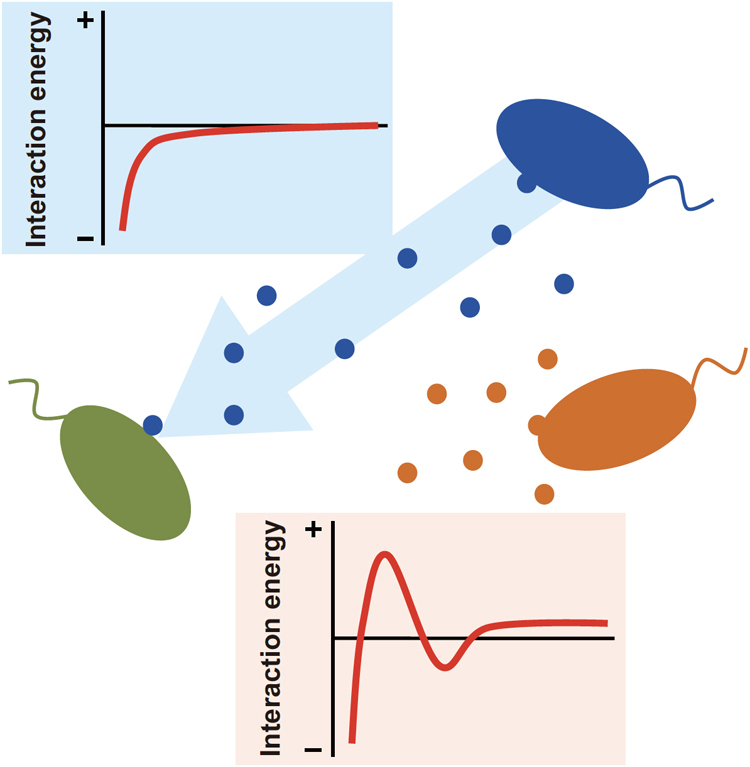 Although the purpose of secreted MVs remains unclear, recent reports have provided evidence that MVs selectively interact with microbial cells in order to transfer their content to the target species. Herein, we review microbial interactions using MVs and discuss MV-mediated selective delivery of their content to target microbial cells.